If Arlington Hambright decides to transfer, how does this affect OSU’s depth at the left tackle spot? News broke yesterday that Oklahoma State offensive tackle Arlington Hambright has entered his name in the NCAA Transfer Portal. While nothing is official, there’s a chance the former junior college transfer isn’t on the Oklahoma State roster at the start of next season. With that potential, I wanted to take a look at what this means for the Cowboy offensive line moving forward, specifically the left tackle position. 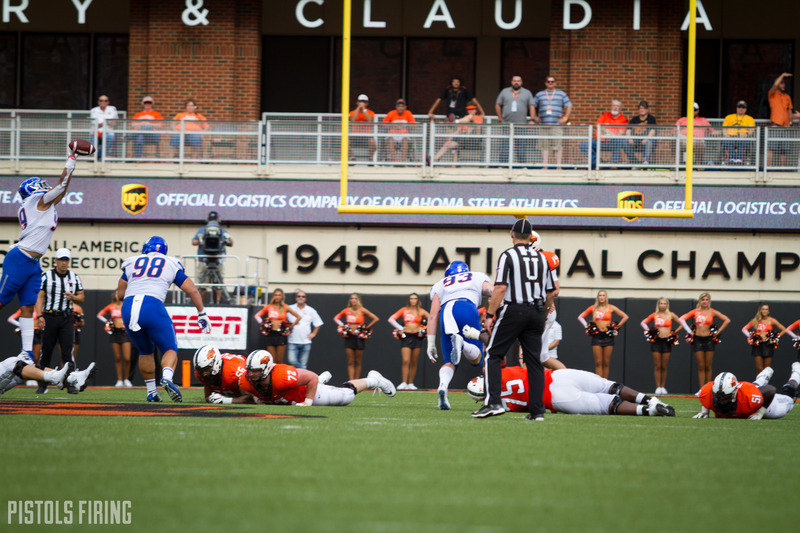 If Hambright were to transfer, the Pokes would return two players with experience at the left tackle spot for 2019, Dylan Galloway and Teven Jenkins. Jenkins, who will be a redshirt junior in 2019, moved from right tackle to left tackle after Hambright went down with an injury in the fifth game of the season against Kansas. However, after right tackle Shane Richards was also injured, Jenkins returned to the right side of the line, and Galloway assumed the left tackle responsibilities. He struggled at times, but overall showed promise as a run blocker and showed good technique and footwork in pass protection, as shown below. Hambright’s pending departure leaves Galloway as the leader to take over the starting duties next year, but with Jenkins manning the right side of the line, who will be the next men up on the depth chart? On the roster currently, I’d say the best bets to compete for the left tackle job are soon-to-be redshirt senior Larry Joubert and redshirt freshman Jacob Farrell. Joubert saw action in six games during 2018, on both offense and special teams. Farrell, the former three-star recruit from Sulphur, Okla., redshirted in 2018 after having surgery on his shoulder last August. At 6-6, 285 pounds, Farrell could be primed to step into the second string role behind Galloway. If OSU experiences some injury problems at left tackle in 2019, they could look to move Jenkins back over to the left side, as he has the talent and versatility to play all over. Whatever side of the ball he’s on, he’s going to move people out-of-the-way, as he shows below. If young tackles like Bryce Bray and Hunter Anthony show promise through the spring and into the fall, this will make the Cowboy coaching staff even more comfortable with Jenkins switching sides. Depending on how they progress, you could even see Bray and Anthony take reps on the left side themselves. Of the other new additions from last season, Hunter Woodard is more likely going to be slotted at guard and Tyrese Williams will probably play behind Johnny Wilson at center. The 6-6, 341 pound walk-on Walker Reed is another name to watch. He’s mostly taken reps at right tackle but if injuries become a problem, he may be another option to see time on the left side. Out of these four, I don’t think any of them realistically have a shot to step in next season and play meaningful minutes at left tackle. Michalski projects more as a guard and I think the Cowboy coaching staff sees Wilson as a center. That leaves Birmingham and Miterko. The 6-5, 294-pound Birmingham has the size to play tackle for OSU, but he probably still needs some time to develop his skills. Miterko will most likely need to put on a little weight before he steps on the field, as he’s currently listed at 270. I expect both to be solid players, but don’t think either will be major contributors next season, especially with neither guy enrolling early. There are several graduate transfers currently in the 247Sports Transfer Portal that Oklahoma State may pursue for next season while some of their younger guys continue to develop. There’s Tennessee’s Drew Richmond (primarily played tight tackle) and UCLA’s Justin Murphy (played both guard and tackle), both guys who received offers from Oklahoma State during their high school recruitment. If Hambright does decided to transfer, it definitely throws a wrinkle into the left tackle depth for next season, but with how Josh Henson has been recruiting… I believe the Pokes are fine in the long-term.